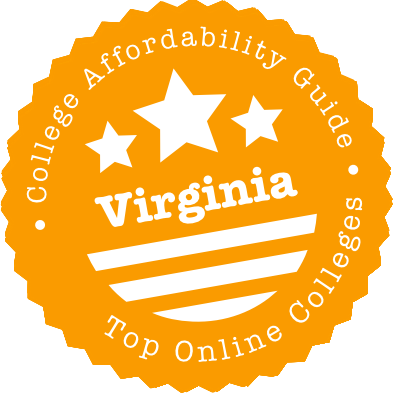 Scroll down to see the top not-for-profit colleges and universities in Virginia offering online degree programs. Liberty University is the country's largest private, nonprofit online university, and LU offers 12 associate degrees, 22 bachelor degrees, 32 Master's degrees, and 14 doctorate degrees entirely online including associate degrees in accounting, business, criminal justice, early childhood education in interdisciplinary studies, education, paralegal studies, psychology, and religion; bachelor's degrees in aeronautics, accounting, business administration, studio & digital arts, criminal justice, early childhood education interdisciplinary studies, government, healthcare administration, history, information systems, information technology, nursing (R.N. to B.S.N. ), paralegal studies, psychology, social work, and religion; Master's degrees in accounting, health informatics, marketing, executive leadership, communication, addiction counseling, professional counseling, education, criminal justice, history, and Christian ministry; and doctorates in accounting, marketing, education specialist, and worship studies. Several scholarships are offered specifically to online students like the Heroes Fund Scholarship, Liberty Advantage, and the Southern Baptist Conservatives of Virginia scholarship. Students can take classes beginning in January, February, March, May, July, August, September, and October. Northern Virginia Community College, the second largest community college in the United States, offers online degrees and certificate programs through its Extended Learning Institute (ELI). Options include four career associate degrees (accounting, business management, fire science, and information systems technology) and about a dozen transfer associate degrees in business, liberal arts, science, and social science. Many of these are specialization tracks. A variety of mostly business-related career studies certificates are also offered online. To keep online learners from feeling isolated, NOVA has a Virtual Student Union, and students can download the ELI mobile app so they can easily access course content, testing information, and other tools. Old Dominion University offers nine undergraduate degrees and 40 graduate and education specialist degrees entirely online including bachelor's degrees in communication, computer science, criminal justice, finance, human services, information systems & technology, occupational studies - industrial technology emphasis, occupational studies - marketing education, and psychology; Master's degrees in aerospace engineering, business administration, computer science, dental hygiene, electrical and computer engineering, engineering management, military career transition program - Virginia teacher licensure, nursing - adult-gerontology clinical nurse specialist/educator, public administration, school librarianship & teaching license, special education, systems engineering, and more; and doctorate and education specialist programs in community college leaderships, education leadership with licensure, English, instructional design & technology, nursing - advanced practice, nursing - nurse executive, occupational and technical studies: career and technical education, and occupational and technical studies. Coursework can be completed at any time of the day 24 hours a day, seven days a week, though some exams may need to be proctored. Students can take courses in the fall (beginning in August) or in the spring (beginning in January). There are also several options for the summer: a 3-week Maymester, a 6-week semester beginning in May, a 6-week semester beginning in June, and a 12-week semester beginning in May. Regent University offers seven associate degrees in business, Christian studies, criminal justice, general studies, history, information systems, and psychology; 30 bachelor degrees in accounting, Biblical and theology studies, business (with an emphasis in accounting, general management, human resource management, economics, and marketing), Christian leadership & management, Christian ministry, communication, computer science, criminal justice, cybersecurity, early childhood education, English, government, healthcare management, history, information systems technology, information systems and technology, international studies, leadership studies, management & leadership, an R.N. to B.S.N. in nursing, paralegal studies, political communication, politics & history, professional studies, and psychology; 32 Master's degrees in organizational leadership, business administration, communication, film-television, theatre, journalism, theological studies, Christian school administration, curriculum & instruction, special education, educational leadership, government, healthcare policy & ethics, and more; and two doctorate degrees in organizational leadership and strategic leadership. These degrees can be obtained entirely online, but they also have several hybrid degrees that can be completed with a combination of on-campus classes and online classes. Students can complete coursework whenever it is convenient, but they should expect to spend 15-20 hours for a three-credit course. A variety of financial aid programs including federal, state, institutional, and private aid are available to on-campus students as well as online students. Tidewater Community College offers online programs in eight areas of study, providing students with a flexible way to earn a transfer degree (which about half of students earn) or a career degree or certificate. Transfer options includes associate degrees in business administration, liberal arts, general studies, or social science. The Associate of Science in Business Administration has the added attraction of being what TCC calls a Z degree, or a program that involves zero cost for textbooks. Instead of buying textbooks, students in a Z degree program use electronic materials, so having reliable internet is doubly important. Career degrees are available in industrial technology and management. Career degrees and certificates are offered in accounting and criminal justice. Although Thomas Nelson Community College (TNCC) has no fully online programs of its own, students have more options than just what's in the catalog, thanks to Shared Services Distance Learning courses. These are classes taught by Northern Virginia Community College (NVCC), the state's largest public institution for higher learning. Since NVCC runs over 20 associate degree and certificate programs, TNCC students should have plenty of courses to draw from. Plus, with campuses in Hampton and Williamsburg, students have access to multiple proctoring sites for exams. Both campuses' libraries loan laptops, headphones and e-readers to distance learning students. George Mason University offers five undergraduate degrees and 10 graduate degrees entirely online: a B.A.S. in Applied Science, Cybersecurity Concentration; a B.A.S. in Applied Science, Health, Wellness, and Social Services Concentration, a B.A.S. in Applied Science, Technology, and Innovation Concentration; a B.S. in Information Technology, Degree Completion Program; an R.N. to B.S.N. in Nursing; an M.S. in Accounting, an M.S. in Biodefense; an M.S. in Bioinformatics and Computational Biology; an M.Ed. in Curriculum and Instruction, Assistive Technology Concentration; an M.Ed. in Curriculum and Instruction, Integration of Online Learning in Schools Concentration; an M.Ed. in Educational Leadership; an Executive M.B.A.; an M.Ed. in Special Education, Applied Behavior Analysis Emphasis; an M.S. in Systems Engineering; and an M.A. on Transportation Policy, Operations, and Logistics. George Mason University also offers many hybrid programs, undergraduate minors, and graduate certificates, and there are many resources on the George Mason University website that will help potential students to determine whether or not they should take online courses. Students can take classes beginning in January, May, and August. Financial aid is available to online students who qualify. Students planning to transfer to a four-year school can complete a transfer associate degree online through John Tyler Community College. Options include business, criminal justice, general studies, and liberal arts. While all the requirements for these degrees can be completed online, students may not have the range of options for classes they would have if attending on campus. For instance, the only science class offered online is biology. Tyler students do have the chance to take online classes offered by Northern Virginia Community College through a partnership between the schools. Tyler also offers several career studies certificates online. In addition to certificates in business topics, a certificate in museum studies and one in cybersecurity are available. VCU has two online bachelor programs (BS Clinical Laboratory Sciences and BS Nursing), two online graduate certificate programs (Aging Studies and Patient Counseling), two online certificate programs (Adult Literacy and Homeland Security and Emergency Preparedness) and one online post-baccalaureate certificate program (Autism Spectrum Disorders). In addition, the university offers 12 master's programs through the following schools and colleges: School of Allied Health Professions (6), School of Engineering (1), School of Medicine (1), School of Social Work (1), College of Humanities and Sciences (1), and the School of Education (2). VCU also offers two online doctorate degrees (Health Related Sciences, Ph.D. and Nursing, Ph.D.). The university uses the Blackboard learning management system for online instruction and collaboration. The university offers the following graduate degrees online: MA Education, Curriculum and Instruction with focus on Instructional Technology, MA Foreign Languages, Cultures & Literatures, MS Ocean Engineering, MA Political Science, Masters in Agricultural and Life Sciences, and MS Aerospace Engineering (concentrating on aerodynamics, structures, propulsion, and flight mechanics). The online graduate program in Information Technology (MIT) is a combined degree and certificate program. There are also online graduate certificate programs in the following fields: Environment Politics and Policy, Natural Resources, Foundations of Political Analysis, Information Policy and Society, Security Studies, Integrative STEM Education, Nuclear Engineering, Local Government Management, Nonprofit and Nongovernmental Organization Management, and Special Education Administration. The University of Virginia (UVA) is part of the Commonwealth Graduate Engineering Program (CGEP), which is a partnership between the State Council on Higher Education in Virginia (SCHEV) and four other schools. CGEP offers opportunities for engineering professionals to pursue a Master of Engineering (ME) degree online by allowing qualified students to enroll in courses offered over the Internet by any of the participating schools. This flexibility may make it possible for students to earn their degree sooner. The School of Engineering and Applied Science (SEAS) at UVA offers online ME degrees in the following fields: chemical, civil & environmental, electrical & computer, materials science, mechanical & aerospace, and systems engineering. The ME program is comprised of at least 30 graduate-level credits, 18 credits of which must be taken in a student's major field of study. Students may be allowed to transfer up to 15 credits towards their degree, if those credits were earned from an accredited program or institution. Many of the courses for the ME degree are delivered in a synchronous, interactive format. SEAS and the Darden Graduate School of Business Administration at the university offer a joint ME/Master of Business Administration (MBA) program that can also be pursued online. Mary Baldwin University's Office of Online and Distance Learning offers more than two dozen online programs leading to bachelor's degrees, master's degrees, or career certificates. The prime candidate for this program is a working adult who already has some college credits. MBU allows students to transfer up to 90 credits from other accredited colleges and universities, so someone with substantial prior credits might need to complete only 36 credits through Mary Baldwin to earn a degree. The college assigns an adviser to help students with transferring credits from other institutions. The online program also accepts high school students who want to get a head start on their college career. Rappahannock Community College offers many options for students who want to transfer to a four-year school to complete a bachelor's degree. In addition to earning a general Associate Arts and Sciences transfer degree, students can choose an area of specialization that will get them ready for classes in their proposed major once they transfer. These options include health-STEM, business, and criminal justice. The college also has partnerships with about 30 four-year colleges and universities in Virginia that ease the way for RCC grads to transfer to the school of their choice. A variety of career certificate programs are also offered online. Shenandoah University offers an online pathway for practicing, licensed pharmacists who have a Bachelor of Science in Pharmacy to earn a nontraditional Doctor of Pharmacy. The program is designed for professionals who are working fulltime, with content delivered in an asynchronous format that allows students to access it 24/7, along with real-time online meetings with faculty and fellow students, who are members of a cohort. Students in this program complete the experiential components of the curriculum at their current place of employment. Each student is assigned a resource team that includes a pharmacy faculty member who has access to an IT support person. Pharmacists in this program must visit Shenandoah University twice for weekend programs. One residency occurs at the start of the program, when students learn to use the required technology. The second weekend residency covers patient assessment. New cohorts start each August and complete the program in about two and a half years. Shenandoah is also planning to offer online graduate certificates in health informatics and genomics. Bluefield College offers about a dozen online programs, primarily in the fields of nursing, business, and education. New online classes start every eight weeks at the Christian college located in Bluefield, Virginia. Bluefield may grant academic credit towards a degree for students who have received military or law enforcement training, and students may be able to take standardized tests to gain credit for other coursework. Online programs geared towards teachers include a Master of Arts in Education and a certificate program for chemistry teachers to earn the state-mandated credentials for educators who want to teach dual enrollment chemistry classes. The college offers two tracks for the M.A.Ed. program - one for teachers with a Virginia license and another that prepares students for initial licensure. The college also offers a 100 percent online, non-licensure Bachelor of Science in Elementary Education. Other bachelor's degrees offered online through Bluefield College include RN to BSN, criminal justice, management and leadership, human services, and entrepreneurism. James Madison University offers several fully online and hybrid degree programs, including the fully online R.N. to B.S.N. degree and a fully online master's degree and certificate in educational technology. The school's Adult Degree Program, which is designed for adult students who have 30 transferable credits and want to complete their bachelor's degree, can be completed through a combination of in-person and online learning. The school also offers two online MBA programs and ranked 12th in U.S. News & World Report's 2015 list of the best online MBA programs. Eastern Mennonite University has online degrees available in business and nursing. The online business program is the Collaborative MBA, with curriculum based on the idea of leadership for the common good. Students can choose from eight concentrations: leadership, health care management, accounting and financial management, leading nonprofits, conflict transformation, sustainable organizations, community development and social action, or a self-designed concentration. The MBA is a 36-credit programs delivered in a cohort model, and students can earn the degree in 22 months. Most of the online MBA classwork involves live videoconferencing, and students must attend a one-week residency at the school in Virginia and must have a one-week international residency. The MBA is a collaboration between four universities. EMU's Master of Science in Nursing is a online program that allows students to concentrate in leadership and management or leadership and school nurse. MSN students may enroll as full-time or part-time students, and they can earn their clinical hours in their own work setting or near their home. The university also offers an RN to BSN program that is set up in a cohort format. Jefferson College of Health Sciences offers online Bachelor of Science (BS) degrees in the following fields: health sciences, healthcare management, and nursing (post-licensure BSN track). There is also a health sciences (3+1) program that gives qualified students the chance to complete a bachelor's degree online in just two semesters. Applicants must have an associate's degree and/or a minimum of 86 transferrable college credits and a GPA of at least 3.0 in order to be considered for the program. BS in Healthcare Management students can choose to specialize in one of two tracks: long term care or medical practice management. There are two master-level degrees currently available: Master of Healthcare Administration (MHA) and Master of Science in Nursing MSN). Students pursuing the MSN degree can specialize in nursing administration or as family nurse practitioners. Jefferson offers two doctoral programs in the healthcare field that can both be pursued online: Doctor of Health Sciences and Doctor of Nursing Practice. At the current time, online graduate certificates are available in the following areas: bioethics, healthcare administration, and healthcare informatics. A Certificate in Medical Practice Management is also available online. Qualified online students can apply to the same financial assistance programs open to on-campus students. Hampton University offers several online degree and certificate programs both on the undergraduate and graduate levels. The following Bachelor of Arts (BA) programs are available: BA in General Studies, BA in Paralegal Studies, and BA in Religious Studies. Bachelor of Science (BS) degrees are also offered online: BS in Aviation Management (Airport Administration), BS in Business Management, BS in Criminal Justice, and BS in Systems Organization and Management. The BS in Criminal Justice program has a specific focus in the areas of corrections and in law enforcement practice and administration. Students accepted to the BS in Systems Organization and Management have the option of concentrating in human resource management. The following Master of Arts (MA) and Master of Science (MS) degrees are currently offered online: MA in Counseling, MA in Educational Leadership, MA in Religious Studies, MS in Information Assurance, and MS in Sport Administration. There is also a Master of Divinity degree offered online with two areas of concentration - executive ministry and pastoral leadership. Online certificate programs are available in entrepreneurship (24 credits), human resource management (24 credits), and paralegal studies (30 credits). Hampton University recently started offering various for-credit and non-credit courses online both for professional development and personal enrichment. From its membership in a regional Electronic Campus to its embrace of dual enrollment online courses, Virginia takes distance education seriously. To help you narrow down your degree choices, we’ve produced a guide to the Commonwealth’s online scene. Here you’ll get inside intel on the most affordable online colleges, learn how to score out-of-state discounts, and see which schools to approach with caution. Don’t worry about remembering everything: At the end, we’ll summarize the most important resources we’ve mentioned. The Southern Regional Education Board (SREB) Electronic Campus has its own online program & course catalog, which includes multiple Virginia colleges. Two 2-year institutions — Northern Virginia Community College and Southwest Virginia Community College — and five universities — College of William and Mary, Old Dominion University, Regent University, Virginia Commonwealth University and Virginia Tech — place courses and/or degrees on the Electronic Campus. Programs with an “E” have equivalent in-state and out-of-state tuition rates. If you’re from Virginia and looking for an online degree not offered in the Commonwealth, don’t worry. You may still be able to find that degree outside the state at a low rate using the Academic Common Market/Electronic Campus, another SREB initiative. The programs that pop up will be in one of the 14 other participating SREB states, and you’ll only get discounted tuition if no public college or university in Virginia offers a comparable program. You’ll apply through the college and must be a certified Virginia resident. Details are on the website. The Commonwealth’s 23 community colleges display their online courses via the Virginia Community College System website. Click on “Advanced Search” to expand your options to hybrid, print-based programs and other distance delivery formats. It’s a bit harder to find full certificate and associate degree programs via the portal, but the course listings are a good starting point to see which colleges have classes in the areas of study you’re interested in. Once you’re finished with an online associate you might be thinking of getting a bachelor’s. Many states have an online tool or webpage to check which credits will transfer. Virginia is no exception, providing an excellent tool at the Virginia Education Wizard. But it does one better by maintaining Guaranteed Admissions Agreements between VCCS schools and the state’s four-year universities. Get the associate degree, meet the GPA requirements for your chosen university, make sure you’ve taken the right credits, and you’re in. Virtual Virginia is the state’s online education portal for high school students, who can use it to study languages or take courses not available at their school. But one of its biggest perks is its catalog of two dozen online Advanced Placement (AP) courses, which are free to Early College Scholars program participants. (Hint: Qualifying for the program involves earning a 3.0 or better). Take a class, score well on the AP exam, and receive not only high school credit but college credit as well. Keep in mind, too, that several Virginia colleges have their own dual credit programs. Liberty University’s EDGE Dual Enrollment Program, for instance, gives juniors and seniors half a credit for high school and three credits toward college — either at Liberty or elsewhere — at a much cheaper rate than undergraduate residents pay. Virginia is a tech hub, so many colleges prepare graduates for engineering and cyber security jobs with in-state defense contractors. It’s no surprise, then, to find that U.S. News & World Report ranks several Virginia schools highly in its categories for Best Online Graduate Computer IT Programs (e.g. Virginia Tech, George Mason, and Old Dominion) and Best Online Graduate Engineering Programs (e.g. UVA and Virginia Tech). There’s no shortage of online degrees in Virginia, but we think you should start your search with the school below. Why? It appears on both our “Top Online” and “Most Affordable” lists, which means it’s ranked highly on measures of quality, flexibility, price and financial aid availability. (Here’s our easy-to-read methodology.) You dive further into stats on the government-run College Scorecard, which details graduation rate, average debt and other student success indicators. Quality counts. In 2018, U.S. News & World Report ranked Old Dominion’s online programs in the top 100 nationally in six educational categories; Online Graduate Computer IT Programs and Online Graduate Engineering Programs were particularly strong. You can learn more about its 100+ online programs on ODU Online. The university’s financial aid department makes it clear that online students qualify for scholarships, grants and loans by giving distance learners their own financial aid webpage. Old Dominion offers a couple of cost-saving initiatives to be aware of. For one, residents of SREB states can take certain STEM programs at the in-state rate via Electronic Campus. Also, thanks to ODU’s participation in the Navy College Program Distance Learning Partnership (NCPDLP), Navy personnel can take courses via CD-ROM at a lower tuition rate while also skipping several fees assessed to online students. The school has a host of other partnerships and funding pathways designed to make college accessible and affordable for both active-duty military and veterans. Plus, many military members serving in the state qualify for in-state tuition. Many substandard Virginia colleges use the state’s proximity to Washington, D.C. to attract eager international students, but American students also need to scrutinize schools before enrolling in an online degree program. The first rule is that a school should be fully accredited by an agency recognized by the U.S. Department of Education. Regional accreditation is generally superior to national accreditation because it’s easier to transfer credits from schools who have the former. But both types qualify schools to distribute federal financial aid to students. If your chosen college isn’t in the SACS directory, it’s not regionally accredited. Move to the Council for Higher Education Accreditation (CHEA) Database to find all schools with regional or national accreditation. Many religious colleges in Virginia are exempt from state certification and choose not to seek accreditation. Below are several other Virginia schools with online programs that have accreditation issues. In August 2016, the American College of Commerce and Technology’s accreditor, the Accrediting Council for Independent Colleges and Schools (ACICS), threatened to pull its accreditation due to multiple issues. Primary among them was the State Council for Higher Education in Virginia’s (SCHEV) “decision to revoke the campus’s certificate to operate due to the institution’s failure to comply with SCHEV requirements, raising critical questions about the institution’s ability to continue to operate.” The school had until November 2016 to convince the Council that it deserves to continue operating. As of then, it continued to be authorized to operate by SCHEV. The college will probably outlast its accreditor, whose regulatory status the U.S. Department of Education (ED) is moving to pull. Students at ANU’s six Virginia campuses have access to the university’s eLearning platform. Although these for-profit schools themselves don’t necessarily have quality concerns, their accreditor does. ACICS is in the process of losing its federal recognition, which would leave its schools unaccredited and those students without access to federal financial aid. ACICS appealed the decision to the ED in October 2016, which should give schools like ANU time to seek accreditation elsewhere, thanks to a SCHEV contingency plan. This Richmond school with an online RN to BSN program is accredited by ACICS, whose recognition as an approved accreditor the ED moved to revoke in 2016. ACICS appealed the decision in October 2016. While ACICS awaits a final verdict, its schools remain fully accredited, and SCHEV has given them additional time to transition to another accreditor. Everest College’s for-profit campuses at Chesapeake and Woodbridge are also accredited by ACICS, but unlike some other schools on this list, it has a complex history. Everest was owned by Corinthian Colleges in 2015 when the company went out of business due to fraudulent graduation and job placement numbers that drew ED action. In 2016 the Associated Press found that the new owner was following in its predecessor’s footsteps. In May of that year, the ED placed a new independent monitor in charge of overseeing the college’s campuses. The Chesapeake and Woodbridge campuses are under a show-cause directive from ACICS (the last stage before their accreditation is revoked) because the “unaudited financial reports for the twelve months ended June 30, 2016…do not evidence financial stability.” As of October 2016, Everest was attempting to switch to another national accreditor, the Accrediting Commission of Career Schools and Colleges (ACCSC). The ED placed the for-profit chain’s Norfolk campus on “heightened cash monitoring” in 2015 because of concerns with its “financial responsibility” related to federal aid. IGlobal University is accredited by ACICS, whose recognition as an approved accreditor the ED moved to revoke in 2016. ACICS appealed the decision in October 2016. While ACICS awaits a final verdict, its schools remain fully accredited, and SCHEV has given them additional time to transition to another accreditor. For-profit Miller-Motte’s Roanoke and Lynchburg campuses, as well as its online outfit, are accredited by ACICS, whose recognition as an approved accreditor the ED moved to revoke in 2016. ACICS appealed the decision in October 2016. While ACICS awaits a final verdict, its schools remain fully accredited, and SCHEV has given them additional time to transition to another accreditor. The school’s Lynchburg campus is under further scrutiny from the ED, which placed it on “heightened cash monitoring” in 2015 because of concerns with its “financial responsibility” related to federal aid. Sentara, which offers online courses but not whole degrees, is accredited by ACICS, whose recognition as an approved accreditor the ED moved to revoke in 2016. ACICS appealed the decision in October 2016. While ACICS awaits a final verdict, its schools remain fully accredited, and SCHEV has given them additional time to transition to another accreditor. Stratford, a for-profit college with an online presence to complement it locations across the state, is accredited by ACICS, whose recognition as an approved accreditor the ED moved to revoke in 2016. ACICS appealed the decision in October 2016. While ACICS awaits a final verdict, its schools remain fully accredited, and SCHEV has given them additional time to transition to another accreditor. The school also held an abysmal graduation rate in 2016 of just 12 percent (compared to a national average of 42 percent). While that’s comparable to several of the state’s community colleges, one might expect more from a university with one of the highest tuitions in the state. UoNA, which offers online courses but not whole degrees, is accredited by ACICS, whose recognition as an approved accreditor the ED moved to revoke in 2016. ACICS appealed the decision in October 2016. While ACICS awaits a final verdict, its schools remain fully accredited, and SCHEV has given them additional time to transition to another accreditor. The for-profit school sports an unattractive graduation rate in 2016 of 14 percent. While it shares that rate with a few of the state’s community colleges, its tuition is roughly three times higher. Virginia College is a for-profit whose Richmond campus and online campus are accredited by ACICS, whose recognition as an approved accreditor the ED moved to revoke in 2016. ACICS appealed the decision in October 2016. While ACICS awaits a final verdict, its schools remain fully accredited, and SCHEV has given them additional time to transition to another accreditor. Virginia International University is accredited by ACICS, whose recognition as an approved accreditor the ED moved to revoke in 2016. ACICS appealed the decision in October 2016. While ACICS awaits a final verdict, its schools remain fully accredited, and SCHEV has given them additional time to transition to another accreditor. Southern Association of Colleges and Schools Commission on Colleges (SACSCOC): SACS is the regional accrediting body for Virginia’s degree-granting colleges and universities. State Council of Higher Education for Virginia (SCHEV): SCHEV keeps track of institutions operating in the state, and its website has loads of resources. It publishes information on the Academic Common Market, features a degree search tool that can help you find any program in the state, and provides links to more than a dozen online degree completion programs in the state. Virginia Education Wizard: The Virginia Education Wizard guides students and professionals alike in assessing career goals and finding education or workforce training to get them there. Two of its resources are particularly useful: a Transfer Planning Tool and a filterable search tool of all programs administered by Virginia colleges — public and private. Virtual Virginia: Virtual Virginia offers online courses to the state’s high schoolers, including AP classes that can lead to college credit. Southern Regional Education Board (SREB) Electronic Campus: SREB lists online degree programs or courses offered by participating institutions throughout the South. The website also answers questions related to financial aid and credit transfers, and can tell you which out-of-state programs qualify for in-state tuition benefits or a discounted rate. Virginia Community College System: When you’re done searching for every available online course from the state’s two-year colleges, look up the tuition and fees (including e-learning rates) and read individual transfer agreements between VCCS and four-year colleges in the Commonwealth.